After college, Tom played with various local jazz groups. He recorded with vibraphonist Dave Pike and Rod McKuen and toured with Carmen McRae, Joey Bishop, Helen Reddy, and Donna Summer. After leaving the road in 1978, Tom returned to Disneyland and stayed until 1985. He recorded with Milt Jackson and Ray Brown and worked with a variety of jazz artists. It was during this period, that Tom began to work in the LA studios as a keyboardist. In 1981, Tom, John Heard, and Sherman Ferguson formed the trio Heard, Ranier, Ferguson. The group produced an eponymous album in 1982. Tom became a full-time studio player in 1985. He has worked on television shows such as “Moonlighting,” “Beauty and the Beast,” “Star Trek: Enterprise,” and “Family Guy,” and on films, including “Forest Gump,” “Ted,” and “Frozen.” He recorded and toured with Barbra Streisand for her millennium concert series and is frequently a member of the Academy Awards orchestra. 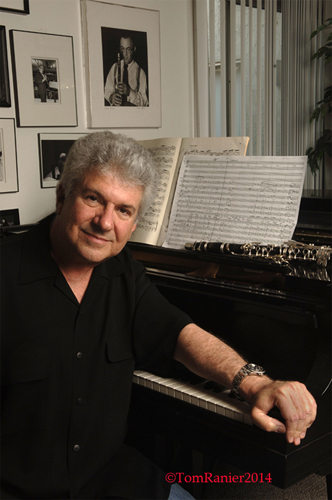 Throughout his studio career, Tom has continued to play and record jazz. In 1997, he recorded his third album, “In the Still of the Night.” Tom was part of the trio 3prime, featuring Peter Donald on drums and Abraham Laboriel on bass. 3prime produced one album, “Live at Rocco’s,” in 2001. From 2005 to 2013, Tom was a keyboardist and an arranger for the television show, “Dancing with the Stars.” He has been a full-time member of the orchestra for “The Simpsons” since 2011. Our very first CalJAS performer, Ron Eschete has been with us since 2004. Shortly after leaving Loyola University, Ron was tapped to tour with Buddy Greco. While on tour with Greco, Escheté set his sites on the Los Angeles music scene. In 1970 Escheté relocated to California, working and recording with vibist Dave Pike. In 1975 he joined forces with pianist Gene Harris and quickly establish his reputation as a premier accompanist. Over the decades Escheté has worked with the greatest artists in jazz including: Ella Fitzgerald; Sarah Vaughn; Diana Krall; Dizzy Gillespie; Milt Jackson; Ray Brown and many more. Guest vocalist and host, Becky Hughes along with CalJAS President Dale Boatman, will be featured on selected vocals. Ron Eschete is my favorite jazz guitarist! Have been a fan of Ron’s since the first time I saw him play at Bacci’s in H.B. Ron was in superb form at Fuzion, too! He’s been a favorite, featured jazz guitarist at the Tee Room in Newport Beach, where we’ll see him tonight. Please keep me apprised of Ron Eschete’s upcoming gigs. Thanks!